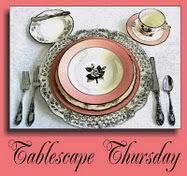 Please join the party at Tablescape Thursday. to see many more wonderful tablescapes. Tonight Hubby and I will be alone, so I thought I'd set a casual table for two. The idea came from the thrifted salad plates. I snagged a set of 8. Something just drew me to them-kind of retro vintage. Found out the pattern is Homer Laughlin-Desert Lily. I thought they kind of looked tropical. The chargers were also thrifted-I only have 2, so I'll be on the lookout for something similar. 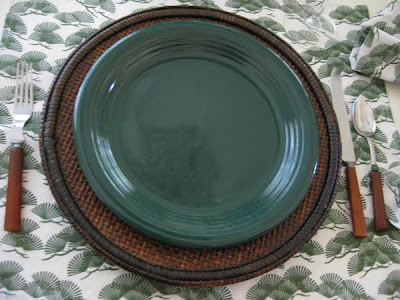 Green plates-Good Will. Wooden plates I've had for ages-I got them at a garage sale. The flatware is Bakelite. I bid on a silent auction years ago at my local thrift store and won these. The day I bought the Homer Laughlin plates I saw this. I'm not sure what it is-if anybody knows, please let me know. I thought the colors went perfect with the plates. It opens and there is a small accent piece on the other side of the flowers. I cut some oleander because I think it kind of ties in with the look. Later I found this plate at a thrift store. I've seen the pattern out there, but don't know what it's called. I just got the one bowl. The pineapple was made by my Aunt Ruth. I think it's a fun addition and will use it for our salad tonight. I made the placemats and napkins-fabric from Hancock Fabrics. Wooden napkin rings-thrift store found yesterday. Thanks for all the bloggy love last week on my first scape. You guys are awesome! My goal is to use mostly what I have and supplement things from GW or thrift stores. So far so good. It looks so pretty and perfect for summer. Dear Leslie, You have some nice treasures from the thrift shops. I love shopping the thrift places!!! 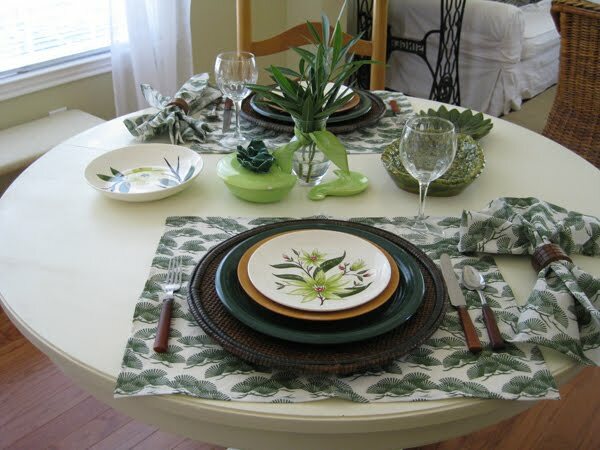 You have set a very nice table to celebrate tablescaping. 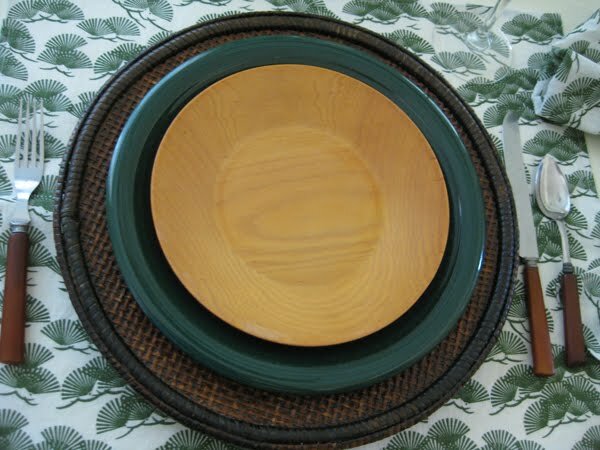 What a cute table setting for you and your hubby :) Love the green against the wood. Great finds Leslie! I love the greens, a very cute table setting! 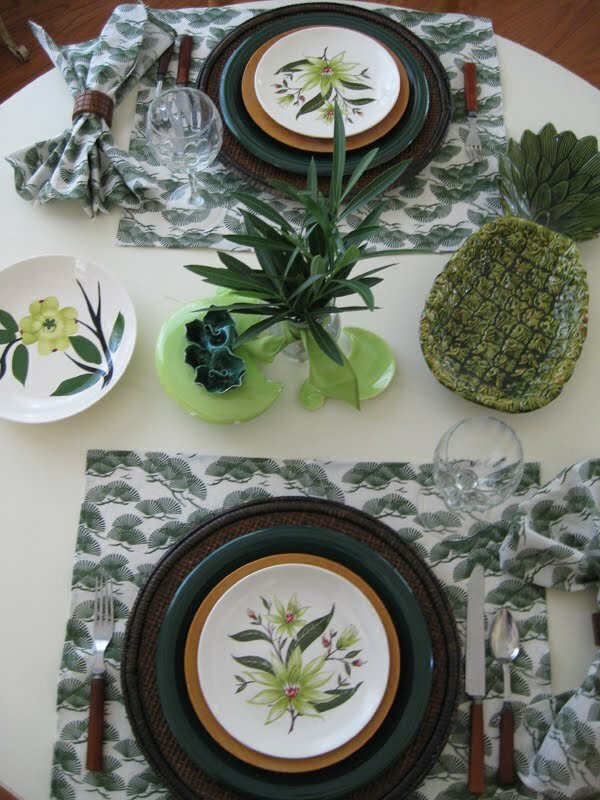 Those Desert Lily plates are wonderful! And you've done an amazing job of building a great table around them! Brilliant, adding the oleander sprigs! And what a cool and interesting set the two-piece green thingamajig is! I hope you find out something about it. Thanks for visiting me this week! It's so pretty! what great finds you have. thanks for stopping by and commenting! What a nice little intimate setting, Leslie! 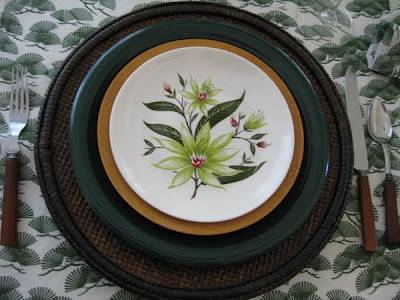 I love the Desert Lily plates, and that green thingy works just perfectly with it all! Leslie, you are really good in combining nice things. I love your table, all the things are somehow related to nature. So everything matches to the table. The greens and the wood, wicker and this woodylike flatware. Those salad plates look so botanical like the Surinam etchings of Maria Sibylla Merian. They really talk to me and the dark plates and chargers are like a frame. Beautifull! Your family is very creativ, I guess. 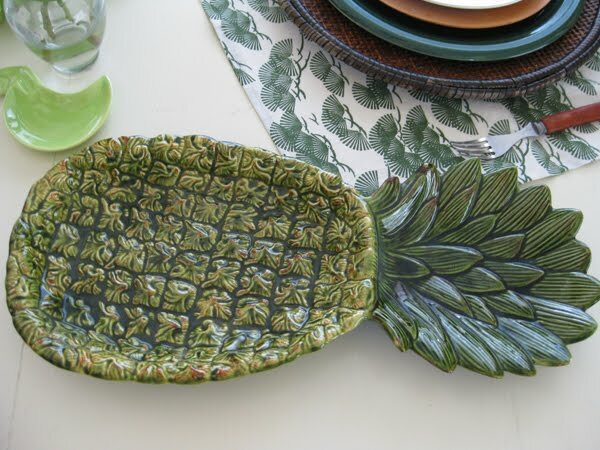 Your aunt did a great job by making this awesome pineapple-plate and you made a great job with the placemats. I love to sew my own things for the table, it allows so much more creative freedom. And this little green flower item is really interesting. I think it is just an decorative art element, I have never seen before such an item. Leslie, you know I love your table...anything green is a favorite! The salad plates are so perfect with the dark green of the dinner plates. I have no idea what your piece is but it is sure lovely on this table. I love the way you put together all the pieces on this table. Green always appeals to me. What a nice table you've set! Thank you so much for coming to visit me. Very pretty combination of plates. Don't you just love Goodwill? I like your retro vintage. 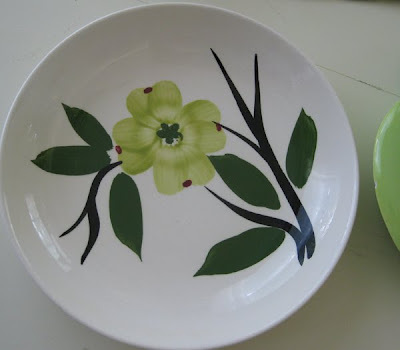 My mother had the dogwood blossom dishes so they are nostalgic for me. I don't know what happened to them but I wished I had them so several years back I bought a four piece setting and some platters. My daughter has them now and I would like her to do a tablescape on my mother's table she has. That would be neat for me. Such a fun table setting Leslie! 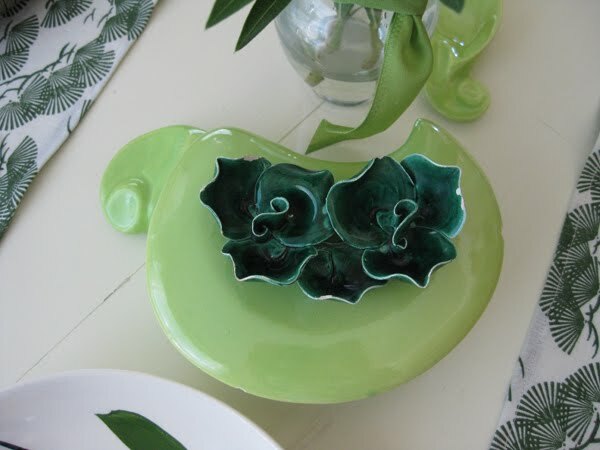 I love the unusual little what-not piece, it looks very much at home around your vase. You've got a terrific eye for putting things together. Very inviting table...love the pineapple...kudos Aunt Ruth!!! Also love the dogwood plate...it reminds me of home! Thanks for stopping by! Great colour....the greens feel so fresh on a hot day like today. You are always welcome for tea. Thanks for stopping by today. I love this kind of tablescaping where we add things one at a time, and build up the look. What a nice table! Love your chargers! It all came together very nicely! Don't you love it when you keep finding the perfect item that you need! Beautiful colors! I love everything about this table! Love all the plates, and the pineapple is really a treasure! Love the flatware also! Thanks for stopping by! I love your tropical summery table. I have a fondness for all things tropical. I love how you found vintage items that fit it so well.